The grandparent-grandchild relationship bond is unlike any other. As life expectancy numbers continue to rise, we are witnessing more children forming strong—and longer—relationships with their grandparents, something that past generations may not have had. Maybe you were lucky enough to have a grandparent-grandchild relationship or two in your life growing up, or maybe you never got to experience the love from a grandma or the wisdom from a grandpa, but if your child is about to be born into the world, or already is in the world, with loving grandparents, here are the benefits of keeping their relationship strong. From the moment they are born, your children are studying your habits and reactions and learning from everything you do. You and your husband may have a strong relationship, but sometimes it takes witnessing love elsewhere that really solidifies the idea in a child’s mind. Spending time in another house, even if it is just your parent’s or in-law’s house, opens their eyes to how another couple or individual lives and can be a great, and easy, learning experience, especially when they are younger. As parents, we often feel that we are still learning about life—and we are! Grandparents play a role in the family for passing down the family history, telling stories about a time long ago and instilling lessons about how to live a grateful and full life. Your children may one day roll their eyes as they listen to you tell your college stories for the twentieth time, but when their grandparents begin to tell a tale about their childhood, we can bet your child will tune in. These stories will help shape them and introduce a strong familial tie into their lives. When it comes to others caring for your child, the ones with close grandparents are the lucky ones. Grandparents treasure their time with their grandchildren, so if you and your significant other need a night out, you can usually count on them to help out. Even if you are spending the day as a family, having an extra, trustworthy set of eyes on your children while at the park or in a crowded area will give you a sense of calm that you may not have even with a nanny or friend nearby. Having a trusted family member who adores your kids just as much as you do can make raising a child much easier. It’s not only the grandkids and the parents who see benefits of these bonds—grandparents see it, and feel it, too. Studies have shown that grandparents who are involved in their grandchildren’s lives perform better on cognitive tests and have sharper minds. As your kids get older, your parents will too, and the bond they form will grow with them. 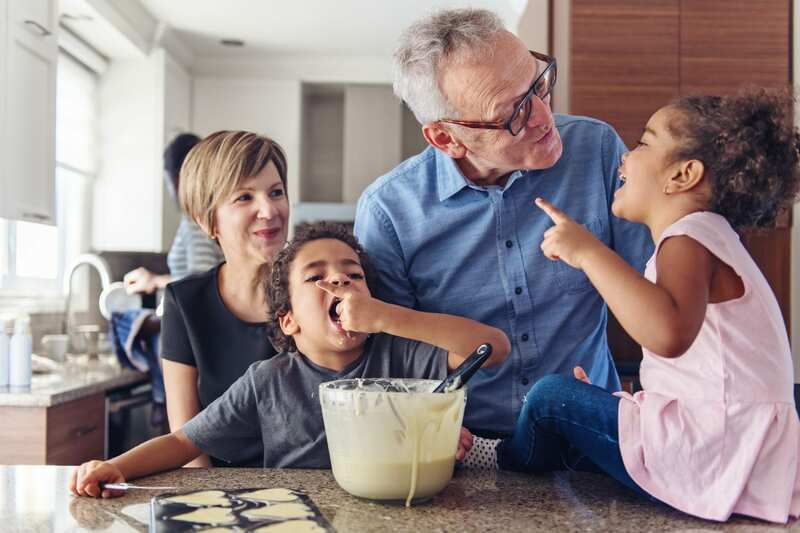 Grandparents who are “keeping up” with their grandchildren often report feeling younger, more in-tune with the world around them and may even live longer lives! As kids get older, especially as they enter pre-teen and teenage years, emotions run wild. Often, the last place a kid wants to go to talk is their parents. But if a child has a strong bond with their grandparents, it’s likely that they will choose them to talk to when times are rough. If you are a new mother or a mother with young children, this may not be on your mind just yet, but time goes quickly and as your children grow, you’ll see the benefit of them running to grandma every time a boy hurts their feelings or finding that time spent with grandpa makes them forget about the drama that day at school. Yes, you give your child more love than you could even imagine, but when they feel it throughout multiple generations, it becomes even stronger. Having doting grandparents, whether they are mushy and warm or stern and strict, teaching your kids about love is one of the greatest gifts your parents can give your child. Don’t take grandparents for granted! The grandparent-grandchild relationship is one to be fostered and supported throughout the lifetime.